I feel that I'm preaching to the choir in saying this, but vintage watches are very in at the moment. There has always been, and always will be, a market for vintage Pateks and Rolexes. However, recently there has been a resurgence in appreciation of smaller brands. Vintage Seiko, Bulova, Hamilton and others are being seen on wrists everywhere and it's really great seeing love for these smaller brands. I've said before that it's not the name on the dial that matters, but the movement on the inside. Whilst chatting with Nick (the man behind 10:25), it was clear that he also holds this philosophy and his personal collection and his site's inventory mirror this perfectly. You don't have to spend a fortune to get a cool vintage watch; Nick has a Benrus pilots watch, a Clebar chronograph, a 71 Omega Deville and a Seiko 6139. With 10:25 dedicated to finding diamond-in-the-rough vintage timepieces that are both beautiful and affordable, it's fantastic to see a collection of curated watches that won't cost the earth and are from a reliable source. 10:25 Vintage have a great selection that is frequently updated. I've picked out five of my favorites from their current selection. As always when buying anything online, research is key and always contact the seller if you have any queries about a watch. I've made no secret of the fact that I love Universal Genève and in my opinion they are probably the greatest casualty of the quartz crisis. A true manufacturer who always made their own movements throughout their lifetime (compared to others who bought in movements), Universal Genève is a true watchmakers watch. From annual calendars to the first micro-rotor movement, vintage U.G.s are always highly sought after. I imagine this offering will appeal to a lot of people as well. This time-only Cal. 263 from 1943 is simply a beaut. As with anything that's made it to seventy years of age, there are some slight wrinkles. The once bright lume on the hands has faded into a dark grey, the sweeping seconds hand, once a brilliant candy red, is now a dull crimson and the dial, once a crisp white, has become a gentle cream. Compared to contemporary pieces the Cal. 263 sits quite small at a 31.5mm diameter, however it exudes a character far greater than its measurements. The Universal Genève Cal. 263 is currently available at $625. When you say the name Waltham you wouldn't be at fault for thinking only pocket watches. Over its one hundred and fifty year history, along with changing their name six times, the Waltham Watch Company was the name of American timepiece manufacture, striving to create pieces so precisely that any part would be fully interchangeable. In fact, their pocket watches were so robustly made, that recent start-up Vortic Watches have succeeded in converting the movements to wristwatches with the aid of 3D printing metal. Today though, it's their wristwatches that are the focus and this alarm piece from the 1960s is a testament to Waltham's aim of providing high quality watches at affordable prices. The mechanical alarm is by far my favorite complication, elegant in design and yet practical in function. You can see a video of the alarm working here. I can guarantee that this will wake you up in the morning, whether it the vibration on your wrist or the mechanical whirrrrr resonating from your bedside table. Some of the gold plate on the case has worn away to reveal a mellow brass tone underneath, however the dial and hands are still in great condition. The Waltham Wrist Alarm is currently available at $250. I almost didn't include this one as I was very very close to buying it for myself. Luckily for you, journalistic integrity prevailed (and realizing that I'm quite broke at the moment) and you're able to take a look at this beautiful Seiko Chronograph on 10:25. 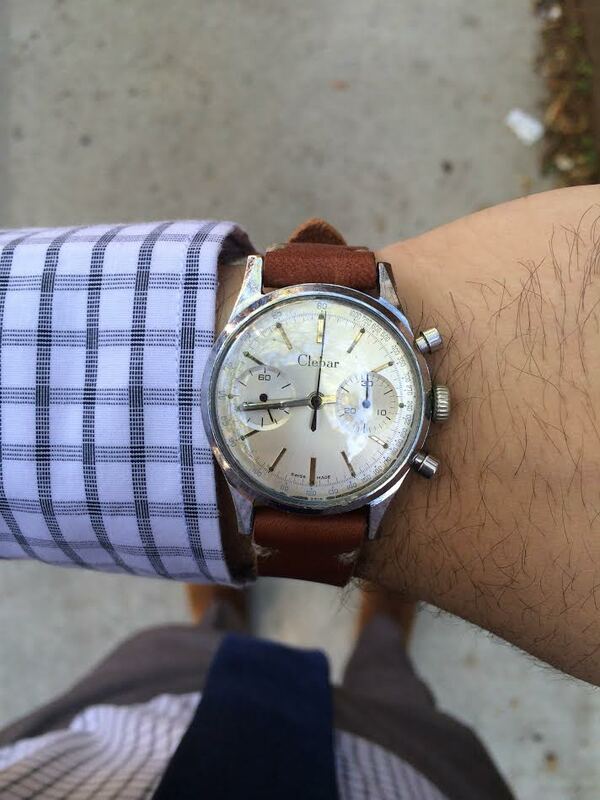 The 6139 was the world's first automatic wristwatch chronograph and was the first automatic chronograph in space. I've gone on record saying I love late seventies designs and this helmet style chronograph is no exception. Similar to the Omega Flightmaster case, the 6139 has large curved hooded lugs which fit the watch nicely to the wrist. This piece has an English/Arabic day wheel, which is neat. Arabic is a beautiful language and this watch would be useful if you ever find yourself in Riyadh. For those interested the day currently showing is Thursday (al-khamis). The Seiko comes on a mesh strap that fits the "future" design elements of the 70s. The Seiko 6139-7101 is currently available at $525. Whilst chatting with Nick, we both agreed that we couldn't believe that this piece was still available. If you love military or tool watches, then this is the one for you. Issued originally to Air Force Pilots during the Vietnam war, these Benrus pilot's watches feature clear and legible dials that could be read easily during flying. For those who just love that dial symmetry, this piece doesn't feature a date. Almost exactly fifty years after it was first issued (Aug 1965 is engraved on the case back), this piece is still in remarkable condition. There are some slight scratches on the case back where someone has attempted to open it (it's a one-piece case so good luck with that), but other than this it features the original crown and a deep black dial in excellent condition. The mild scratches on the hesalite crystal could easily be buffed out with Polywatch or kept if you're a purist. Perhaps you'd like to imagine they occurred when the pilot's wrist banged against the cockpit of his F-101 during a dogfight over Don Muang. The Benrus Pilot's Watch is currently available at $425. Why doesn't anyone talk about Tissot anymore? A company that made pieces for the Russian Czar and his officers? The first company to make a watch with a plastic mechanical movement? Universal Geneve has seen a resurgence in appreciation over the last few years and I hope that Tissot soon gets its time in the sun as well. I must say that I wish Tissot would go back to using this classic 50s logo; it oozes sophistication a lot more than their current bland Arial font. Compared to other dress watches of the 1950s this piece is essentially a giant, measuring in at 38mm, and could easily feature in a contemporary collection. The counterweight on the seconds hand mimics the elegant sword minute and hour hands, however it should be noted that whilst they are correct for the era/model they were a replacement from a previous service. The Tissot Antimagnetique "Jumbo" is currently available at $425. You can see the entire collection over at www.1025vintage.com and of course follow them over on Instagram/Facebook/Twitter. All photographs were used with the permission of 10:25. Enjoyed this article and would like to be updated with new posts? Subscribe to the Timepiece Chronicle newsletter!